The ripe style of the art of the Shang period 商 (17th-11th cent. BCE) was employed across all media and for various functions (bronze, pottery, lacquerware, jade, ivory, weapons). It was an art determined by carving (Thorp 2006: 201), as can be seen in the many objects of bone or jade found in Shang-period tombs. Types, materials and techniques were inherited from the Longshan 龍山文化 (3200–1850 BCE), Yangshao 仰韶文化 (5000–2000 BCE), and Liangzhu 良渚文化 (3400–2000 BCE) cultures. Decoration was part of the surface of objects, and not just an application on it. Art objects of the Erligang phase 二里岡 (1600-1400 BCE) are characterized by decent decorations, with only narrow bands, while patterns and decos later covert the whole surface of objects. Central figures of the decoration are accompanied by clouds, spirals and quills, often hiding sideline figures. 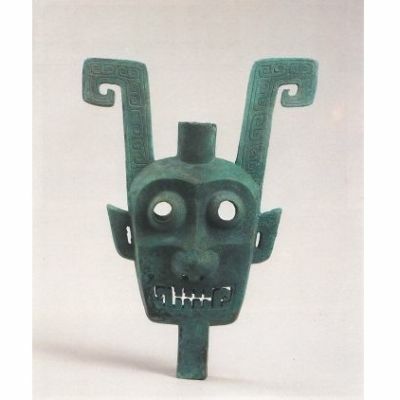 The most important motifs are the taotie 饕餮 mask and other zoomorphic designs, while human faces come rarely into play. 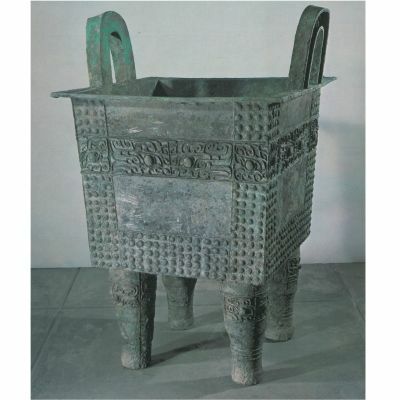 Ritual bronze vessels (qingtongqi 青銅器) played an important part in ceremonies of the upper class of Shang society. 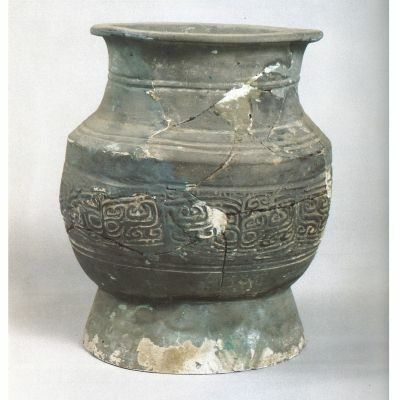 In Anyang, Henan, the seat of the late Shang kings (Anyang period, 1250–1050 BCE), more than 800 bronze vessels were discovered, half of which were found in the tomb of Queen Fu Hao 婦好 which was excavated in 1976. One might imagine how many vessels were taken away by robbers looting the tombs of the Shang kings of Anyang. The huge number of mould pieces found in a workshop of the Anyang site is a testimony for the large-scale production of bronze vessels for the need of the royal house and the princely lineages. The largest vessel of the Anyang period is a square fangding 方鼎 vessel which bears the inscription Si (=Hou) mu wu 司(=后)母戊. It was dedicated to Queen Fu Jing 婦妌, the mother of King Wu Ding 武丁 (trad. r. 1324-1266), is 133cm-high and has a weight of no less than 875kg, and is thus the heaviest ritual bronze vessel ever found. The largest fangding vessel from the Erligang period was found in Duling 杜岭 close to Zhengzhou, Henan, is 100cm-high and has a weight of 86kg (Wu 1994: 144, 146). 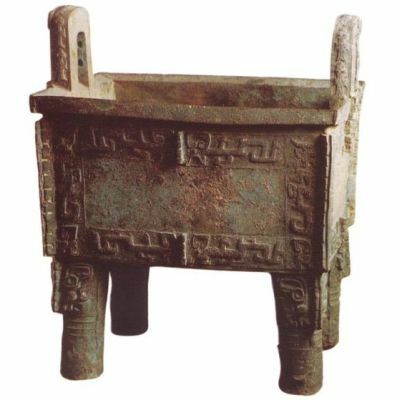 Square bronze vessel (fangding 方鼎) from Duling, Erligang period, unearthed in Zhengzhou, Henan, unearthed in 1974 in Zhengzhou. From Zhongguo meishu quanji bianweihui/Li (1985), no. 6. 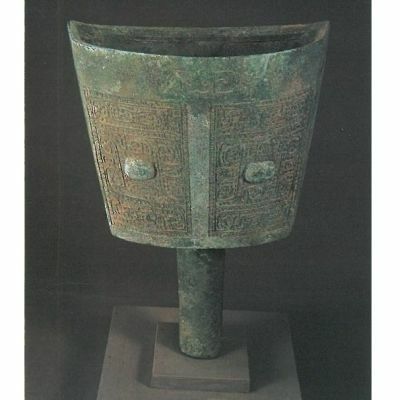 Square bronze vessel from Wuguancun 武官村, Anyang, Henan, unearthed in 1932. From Han (2005), Vol. 1, 54. 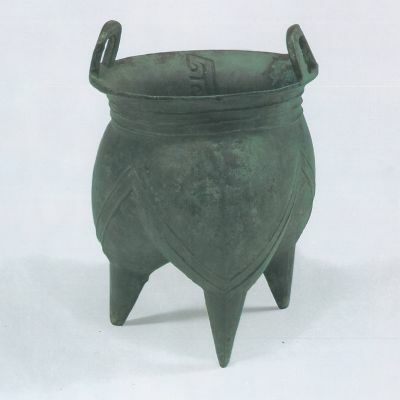 Bronze vessels and other bronze objects like chariot fittings or weapons were discovered in practically all sites of the early and late Shang periods. 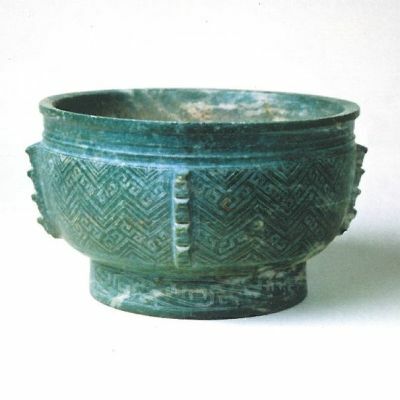 Early Shang bronze vessels inherited the technique of the Erlitou period 二里頭 (2000–1500 BCE), refined casting techniques, decorations and useability, and widened the range of vessel types. 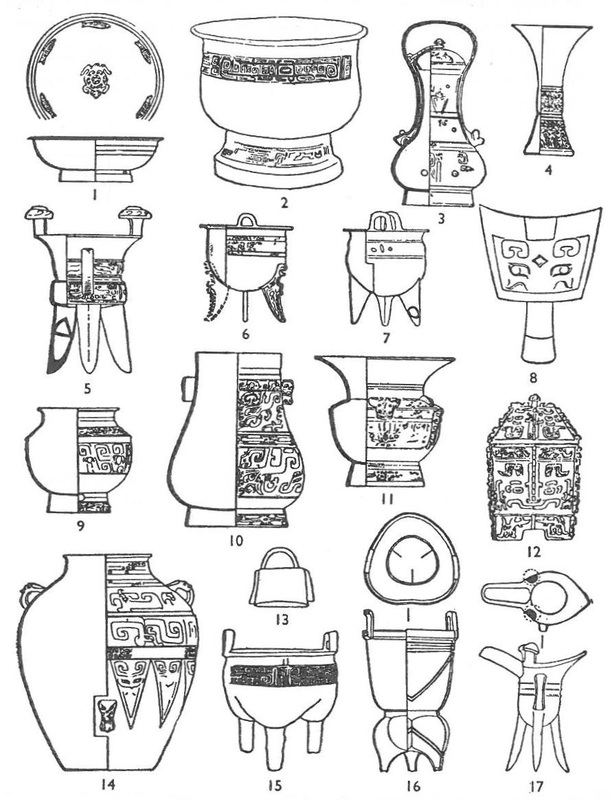 Typical Shang bronze vessels: 1 pan 盤 basin, 2 gui 簋/𣪕 bowl, 3 you 卣 wine can, 4 gu 觚 cup, 5 jia 斝 tripod, 6-7 ding 鼎 tripods, 8 nao 鐃 bell, 9 pou 瓿 jar, 10 hu 壺 jar, 11 zun 尊 cup, 12 yi 彝 receptacle, 13 ling 鈴 bell, 14 lei 罍 jar, 15 tripod of mixed li 鬲/ding style, 16 yan 甗 steaming vessel, 17 jue 爵 cup. From Cheng 1960: Fig. 37. 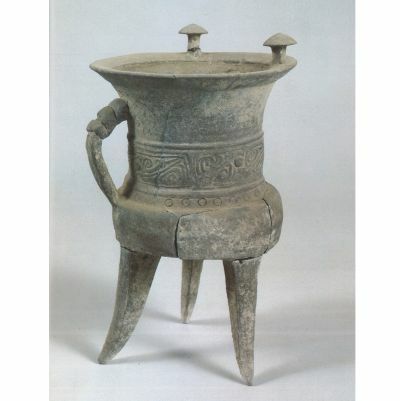 In the early Shang period (Erlitou, Erligang, Yanshi 偃師), bronze vessels imitated widespread pottery vessels, mainly the small three-legged li 鬲. Jue-style 爵 beakers with three legs had first a flat bottom, which later became round and the body of the vessel egg-shaped. New types of vessels appeared, like round-shouldered yan 甗 steamer, looking as if made of two pieces, zun 尊 pots with large, funnel-shaped mouths. In the Anyang period, ding 鼎 tripods, you 卣 jars or yi 彝 containers were still round, but sometimes quadratic or oblong (fangding 方鼎, fangyou 方卣, fangyi 方彝). The mid-Shang period also saw the invention of flat feet (pianzu 扁足) instead of round or pointed ones. The walls of early of middle Shang-period vessels were relatively think and only reinforced at the rim. During the Anyang period, more and more vessels were given square forms, and were formed like birds, beasts or domestic animals; these were mainly zun or gong 觥-type vessels. Walls became thicker during the late Shang period. Erlitou-period vessels were sparely decorated, often just with cloud-patterned bands and taotie masks indicated just by buttons signifying the eyes. This decoration expanded over the whole body of vessels (barring the legs), and was refined. Pattern textures covering the background resemble clouds or spirals. Taotie masks are embedded into this background, often barely recognizable in the early phase. Anyang craftsmen developed the technique a multi-tiered patterns that imitated the depth of carving in jade or other mineralic materials, creating a multi-dimensionality called sancenghua 三層花, in which the relief consisted of the basic pattern of the corpus (tiwen 體紋), a ground pattern (diwen 地紋), and a protruding decorative pattern (zhuangshiwen 裝飾紋). 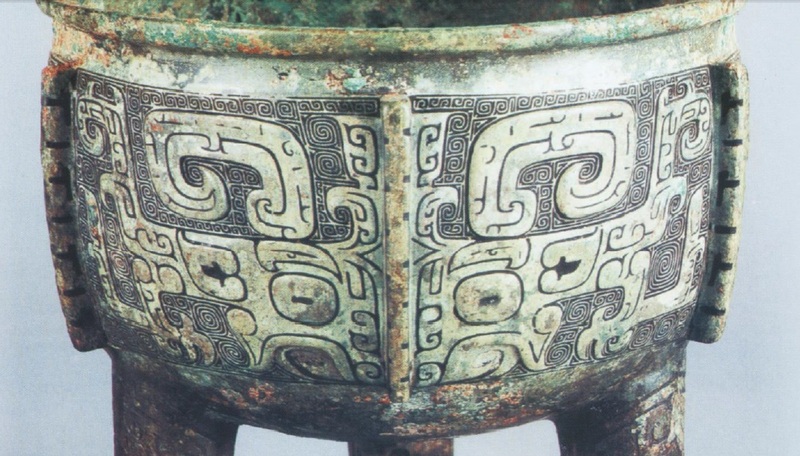 The shoulders of zun and lei 罍 vessels were sometimes decorated with animal heads. In addition to taotie and spiralic patterns, so-called kui 夔 ("snake" or "dragon") patterns were used, clouds, birds, or dragon-like creatures. Some vessels are decorated with heads of sheep or oxen, and a small number with human faces. Vessels of the zun type were as a whole given the shape of animals, like an elephant, a tiger, a rhino, an ox, a ram, an owl, or a beast devouring a man. Incrustation of turquois stones was usual in Erligang objects. The metallic alloy of the bronze was very instable in the early and middle Shang-periods, but usually contained a higher amount of lead. The composition of the allow became much more stable in the workshops of Anyang, with constant shares of copper, tin, and lead. Outside of Anyang, the allow varied widely. It can be assumed that local workshops made use of scrap metal for casting vessels. Early Anyang vessels only bear short inscriptions with "clan insignia" (zuhui 族徽) or the name of a person. The inscriptions became longer only in the later Anyang period, first up to ten, and later up to forty characters, but not longer. The inscriptions refer to sacrifices, presents by the king, banquets or hunts. The technique of casting with several moulds appeared during the Erligang period and was refined by that of add-on casting of legs and handles (tiliang 提梁) of you and he 盉 cans. The technique allowed to create ever more complex shapes of vessels (Du 2008: 72, 104-105.). Left: Ceramic li 鬲-type tripod unearthed in 1999 in Yanshi, Henan, tomb M68, height 21.7cm, from Zhongguo Shehui Kexue Yuan Kaogu Yanjiu Suo Henan Di Er Gongzuodui (2006). Plate 7, no. 1. Right: Bronze li 鬲-type tripd, height 15.4cm. From Zhongguo meishu quanji bianji weiyuanhui/Li (1985), no. 23. Max Loehr (1903-1988) discerned five different styles of Anyang-period bronzes, with the help of which vessels might be dated (Loehr 1953). 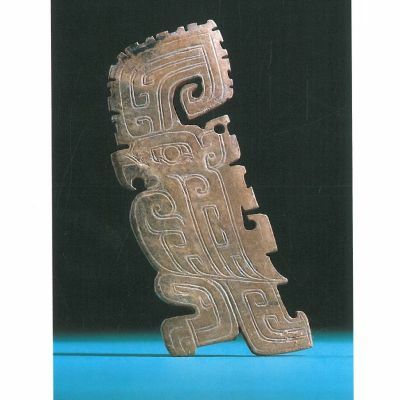 Based on Loehr's model, which was largely verified by archaeology, Chen and Zhang (1990) divide taotie patterns into four types, namely simple mask (duli shoumian wen 獨立獸面紋), branching-tailed mask (qiwei shoumian wen 歧尾獸面紋), bodied mask (lianti shoumian wen 連體獸面紋), and dissolved mask (fenjie shoumian wen 分解獸面紋). No animal masks are found on Erlitou bronze or ceramic vessels, but only dragons and animal eyes. The branching-tailed mask appears in the Erligang period, as lines incised on the moulds. A technological step was reached during the Anyang phase, when masks were embossed on the body of vessels to create a kind of bas-relief. At the same time, the later omni-present cloud pattern for the "canvas" was invented. In the Anyang phase, the branching-tailed mask disappeared and was replaced by the three other types. 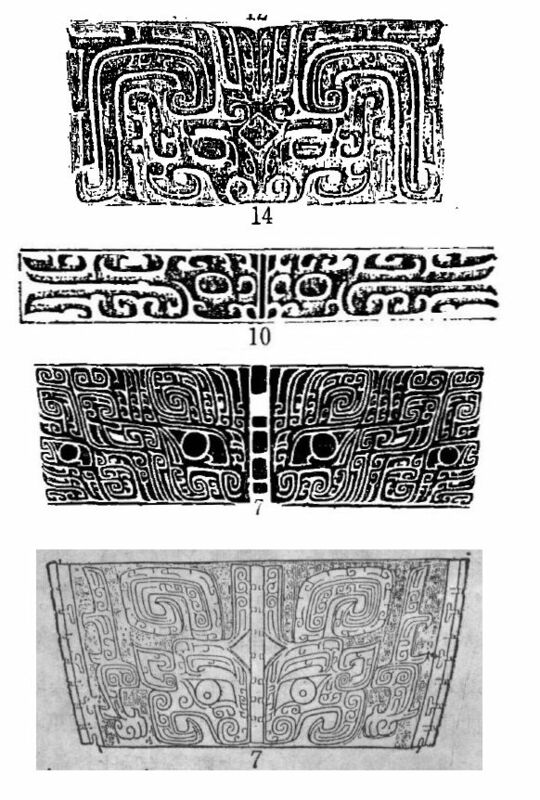 Decorations of bronze vessels with zoomorphical taotie masks, clouds and spirals. Various simple bands from the early Shang period, called "branching-tailed mask", meaning that the two sides of the vessel show the "animal" from the left and the right separately, resulting in "two tails". Chen/Zhang (1990), plate 2, no. 14 (type 1), plate 3, no. 10, plate 4, no. 7, and plate 6, no. 7. Taotie mask with horns, fangs and claws, detail from the body of a late Shang period tripod called Liu ding 劉鼎. The background is filled with spirals patterns (leiwen 雷紋). Tan (2007), 574. Even if a kind of "metropolitan" tradition (Campbell) evolved in the Erligang and Anyang phases, there were many local styles differing from that of Erligang or Anyang. 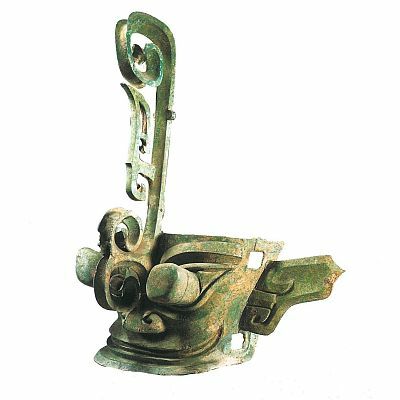 Most outstanding are a large bronze mask found in Xingan 新淦 (新干), Jiangxi, and the many bronze masks and bronze figures found in Guanghan 廣漢, Sichuan, the site of the Sanxingdui Culture 三星堆文化. Left: Bronze mask from Xingan, Jiangxi, height 53cm, distance between horns 38.5cm. . From Jiangxi sheng Wenwu Kaogu Yanjiuyuan (1997). Right: Bronze mask from Sanxingdui, Sichuan, height 82.5cm, width 78cm. From Xiao (2001): 73. Carving of jades (nephrite), other stones, bones, horn, and ivory, was widespread. The resultes had the shape of real or phantastic animals, rarely of humans. 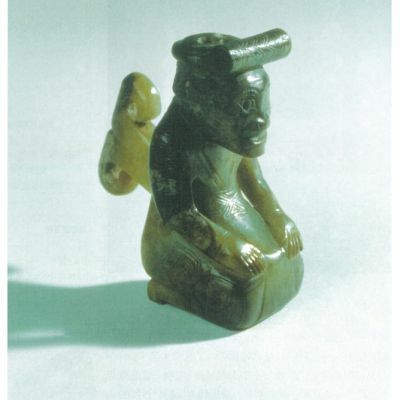 The most important examples of anthropomorphical figures carved out of mineralic materials were found in the tomb of Queen Fu Hao (Anyang phase), but excavations on the site of Erligang also brought to light figures of kneeling humans, tigers, and tortoises (Wu 1994: 134). Xia (1983) discerns ritual jade objects (liyu 禮玉), weapons and tools, and adormnents. Ritual jades include jade discs (bi 璧), square tubes (cong 琮), symmetric plaques with a pointed tip (gui 圭, "sceptres"), asymmetric "sceptres" (zhang 璋), segments of rings or "arcs" (huang 璜), and tiger-shaped objects (hu 琥). To these six traditional types of "auspicous jades" (liu rui yu 六瑞玉), some others have to be added: nearly closed rings (jue 玦), rings with various relations between opening and surface (yuan 瑗, huan 環), hybrids between rings and daggers or axes (qi 戚), and serrated xuanji 璇璣 rings which perhaps served as astronomical instruments. Finds in tomb do not only include nephrite weapons like dagger-axes (ge 戈), knives (dao 刀), spearheads (mao 矛) or axes (yue 鉞, fu 斧), but also tools like hoes (chan 鏟). Left top: Qi 戚-type disk from the Erlitou period. Size: length 10.8cm. Right top: Nephrite gui 簋, diameter 20.5cm. Left bottom: Kneeling person, perhaps used as headgear and therefore equipped with protruding piece at the back, height 7cm. Right bottom: Jade bird, by Chinese scholars identified as a parrot (yingwu 鸚鵡), length 11.2cm. The last three were discovered in 1976 in the tomb of Queen Fu Hao. Parrot from Zhongguo meishu quanji bianji weiyuanhui/Yang (1986), no. 69, the rest from Zhou (2008). 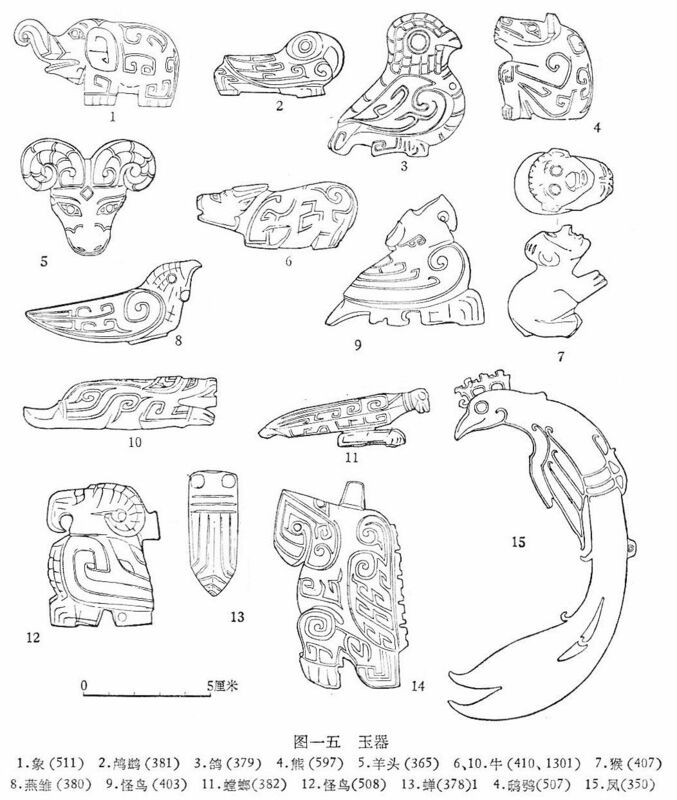 Drawing of zoomorphical jade objects found in the tomb of Queen Fu Hao in Anyang: Elefant (1), cormorant (luci 鸕鷀, 2), pigeon (3), bear (4), ram's head (5), buffaloes (6, 10), monkey (7), swallow (8), bird (9), mantis (11), hawk (12), cicada (13), owl (14), phoenix (15). Scale: 5cm. After Zhongguo Shehui Kexue Yuan Kaogu Yanjiusuo Anyang Gongzuodui (1977), plate 15. Apart from vessels containing various liquids or solid objects, clay was used to shape moulds for casting bronze objects. The moulds survive because vessels were usually cast with the help of two, three or more pieces of moulds. In 1958, a mould for a human face was discovered in Wangyukou 王裕口 west of Anyang. 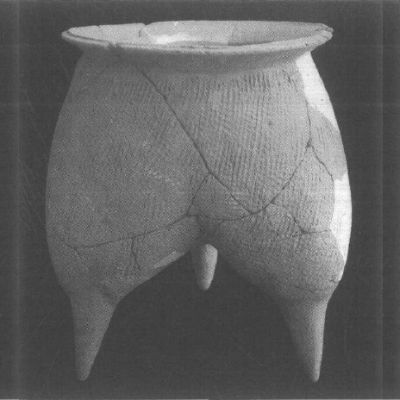 The technique of earthenware had made impressive progress even before the Shang period. "Coloured" earthenware (caitao 彩陶) was an element of the Yangshao Culture, white earthenware (baitao 白陶) produced by the Dawenkou Culture 大汶口 (5000-3000 BCE), and glossy black "egg-shell" earthenware (danke heitao 蛋殼黑陶) was the leading type of pottery of the Longshan Culture. 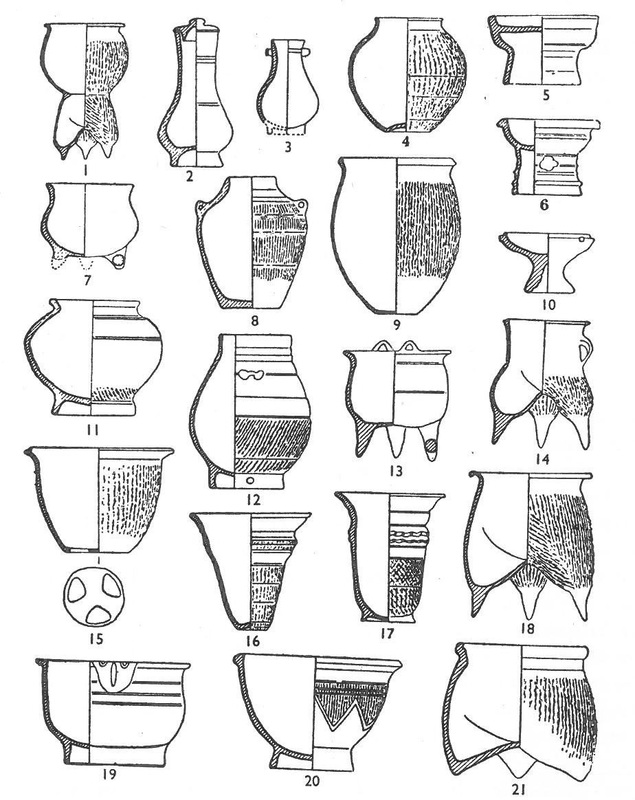 Typical Shang pottery: 1 xian 甗 steaming vessel, 2-3 you 卣 wine cans, 4 yong 甕/罋 jar, 5-6, 10 dou 豆 bowls, 7,1 3 ding 鼎 tripod, 8 lei 罍 jar, 9 guan 罐 jar, 11 pou 瓿 jar, 12 hu 壺 jar, 14 jia 斝 tripod, 15 zeng 甑 steamer, 16-17 zun 尊 vases, 18, 21 li 鬲 tripod, 19 gui 簋/𣪕 bowl, 20 yu 盂 receptacle. From Cheng 1960: Fig. 33. 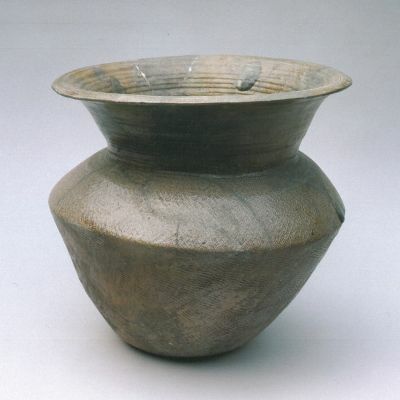 The advancement of firing technique yielded not only the progress in bronze casting, but also in the production of advanced types of earthenware, namely a shard made of kaolin clay (gaolingtu 高嶺土), covered with a coloured glaze (youse 釉色). High firing temperatures resulted in a hard body of fine material which had properties very close to that of porcelain. 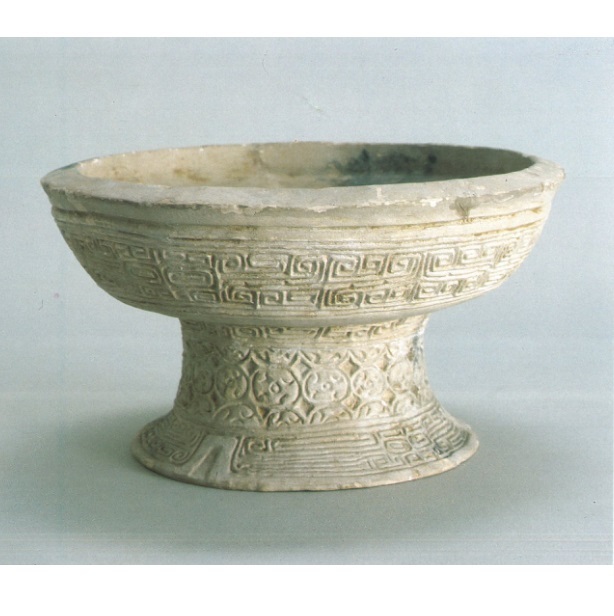 In nearly all Shang-period sites, such types of proto-porcelain were found, but only a small number of them hailed from the late Shang period site of Anyang. These proto-porcelain vessels were covered with a light greenish or yellowish glaze. 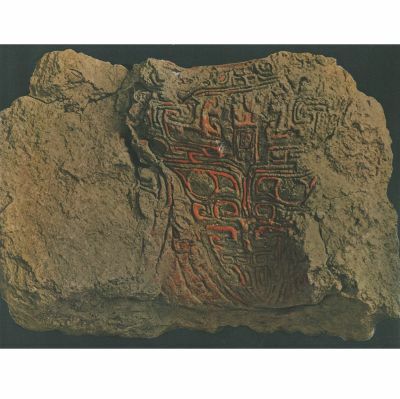 Early Shang pottery was decorated with reliefs created by applying braided mats, texiles, or special pottery pestils. Increasingly, spirals and taotie patterns became fashionable and dominated through the Erligang and Anyang periods. Not many earthenware objects are preserved undamaged. There seems to have been the custom to destroy pottery used for burials (Zhai 2011). Examples of Shang-period pottery. Left top: White ceramic (baitao 白陶) dou 豆-type vessel from Zhengzhou, Henan. The outer surface of the container is decorated with cloud-spiral patterns (yunleiwen 雲雷紋), the stand with round motifs. Height 13cm, diameter 22.5cm. Right top:　jia 斝-type vessel of gray earthenware (huitao 灰陶) from Erligang, Henan. The outside of the container is decorated with a taotie band. Height 27cm, diameter 19cm. Left bottom: Gray earthenware lei 罍 pot from Zhengzhou. Height 27.4cm, diameter of opening 19.5cm. Right bottom: Green-brownish glazed (qingheyou 青褐釉) proto-porcelain vessel of the zun 尊 type, unearthed in Zhengzhou. Height 28cm, diameter of mouth 27cm. From Zhongguo meishu quanji bianji weiyuanhui/Xia (1988), nos. 64, 70-72. Rubbings of patterns on Erligang-phase pottery, left green proto-porcelain (qingci 青瓷), right gray earthenware (huitao). From An (1960). Even if lacquer coating supports the preservation of wooden objects, virtually nothing of the wooden body of lacquered objects (boxes, vessels, coffins, etc.) had survived while parts of the coating itself remains. "Shadows" (yinhen 印痕) of a coffin and of various objects were found in Panlongcheng 盤龍城, Hubei, that was lacquered in red and black. The motifs like taotie, clouds, spirals or birds were carved into the wooden surface, and then covered with one or several films of lacquer. The surface of some lacquered objects in Panlongcheng was decorated with turquois stone and gold foil. Similar objects were found in Wuguancun 武官村, Anyang. The "imprints" of vessels in the soil show that these had been objects with shapes very similar to bronze or earthenware vessels, like gui 簋, dou 豆, dun 敦 or yi 彝. In contrast to bronze vessels, the production of lacquered wooden objects was so cheap that even the tombs of lower functionaries were furnished with such burial objects. Gold leaves were found on several objects in Liulige 琉璃閣, Huixian 輝縣, Henan, and gold foil (jinbo 金箔) on lacquered objects came to light in Gaochengtai 藁城臺 (Taixicun 臺西村), Hebei. A tomb in Liujiahe 劉家河 close to Pinggu 平谷, Beijing, included golden earrings, a golden hairpin, and golden armrings (bixun 臂釧). A bronze tiger figure in the tomb of Queen Fu Hao had gilded eyes. Shang-period gold foil has a thickness of just 0.01mm. In Anyang other partially gilded objects were found. Objects plated with gold foil were also found in Sanxingdui, like a wooden shaft with a length of 142cm, gilded and decorated with fish patterns, or several gilded faces of bronze masks. Gold foil cut in the shape of a dragon. Found in Guanghan, Sichuan (Sanxingdui Culture). Width 11.6cm, height 6.7cm, weight 7.27g. Sanxingdui Bowuguan (2005): 99. Traces of a red-lacquered wooden dou 豆 vessel, with lacquer imprints in the earth distinctly showing the pattern of the decoration, found in tomb M1001 in Houjiazhuang 侯傢莊, Anyang. Gao (1962): Futu 附圖, Plate VI. Remains of colouring were found in the fundaments of buildings, in the engraved characters of oracle bone inscriptions, on the boards of coffins, textiles, on pottery sherds, and from the leftovers of the lacquer coating of wooden objects. The tomb of Queen Fu Hao included a jade mortar and pistil, used to ground minerals like red cinnabar. Even if the script found on the oracle bones cannot really be considered as a form of "calligraphy" (shufa 書法), i.e. a form of art, Chinese scholars studied the early form of characters with great intensity. Dong Zuobin 董作賓 (1895–1963) discerned in his book Jiaguwen duandai yanjiu 甲骨文斷代研究 (1933) five chronological phases of styles, from "impressive" (xiongwei 雄偉, phase 1), and "strict" (yanzheng 嚴整, phase 2) to "negligent and despirited" (sanluan tuifei 散亂頹廢, phase 3), "steep and course" (junqiao zufang 峻峭粗放, phase 4), and finally "attentive and decorative" (jinshi 謹飾, phase 5). 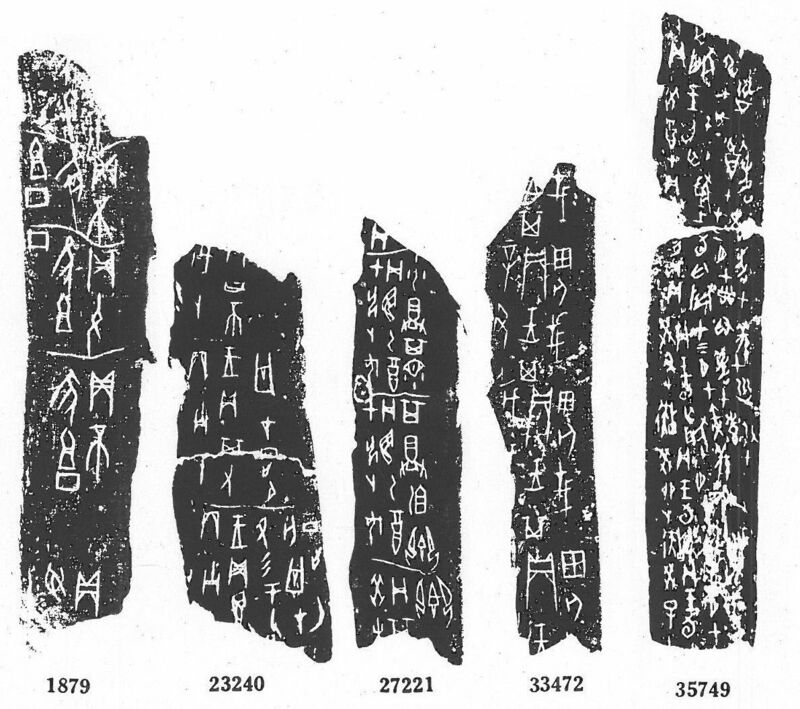 Dong Zuobin discerned five stylistic periods of oracle bone characters. Examples from Guo/Hu (1978-1982). The most important sites of urban activities are Zhengzhou (Erligang) and Yanshi from the early Shang, and Anyang from the later Shang period. The Shang city of Yanshi was located at the banks of River Luo 洛河. It covered an area of 1,700*1,200m and was surrounded by a city wall of 17-20m width, which had seven gates (Wu 1994: 161). Archaeologists found the structures of three large building complexes, whose basement was made of stamped earth (hangtu 夯土). A kind of palace, surrounded by a wall, covered an area of 200*200m, with one main hall, two side halls, a southern corridor, and an inner courtyard. The main building, standing on a terrace with four steps, was 36m long and 12m deep. The whole structure included a well and constructions leading away water from the courtyard (Wu 1994: 161). The Shang city of Erligang has the shape of a somewhat irregular rectangle with a size of 1,700*1,870m, surrounded with a 10-m wide wall of stamped earth, penetrated by eleven gates. The settlements includes a palace-temple area and common dwellings, while workshops and cemeteries were outside the settlement. More than 20 buildings were standing on stamped-earth foundations. These included stone bases (shichu 石礎) or such of bronze (tongchu 銅礎) for wooden pillars carrying the roof. These bases allow to guess the number of rooms in the buildings. One of the buildings has a size of 31*38m. The pillars of building were decorated with bronze fittings decorated with zoomorphical motives. 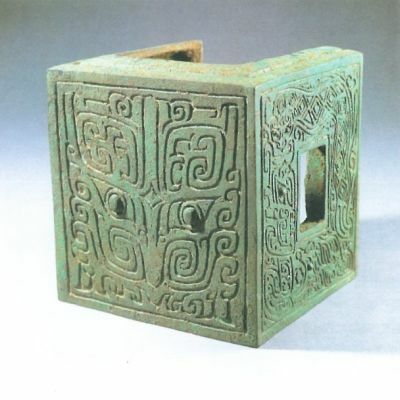 Left: Bronze cube with taotie pattern used as decorative element for a palace or temple in Erligang. Height 18.5cm. From Du (2008), 82. Right: City of Yanshi, state of the art as excavated until 1999. The city consists of a palace (gongcheng) in the southern part which is connected with a wall dividing the space of the city into a southern and a wider northern part. City gates were found only in the northern part. The arrangement is interesting in so far as it is the reverse model of traditional Chinese urban architecture, with the palatial compound in the north. The outer city wall was surrounded by a moat (huchenghao 護城壕). From Zhang (2015). In Panlongcheng in Hubei, a kind of outpost of the early Shang was discovered on a flat hill. This "acropolis" covered a rectangular area with circumference of 1,100m, including only elite buildings, while workshops of dwellings of commoners were outside. One of the three palatial buildings had a size of 40*12m and was built on a low stamped-earth terrace, and like in Erligang, wooden pillars were standing on stone bases. The city of Anyang was not surrounded by a wall, but instead, the metropolis consisted of several settlements, workshops, and tomb areas scattered over an area of no less than 24km2. Close to the village of Xiaotun 小屯, a palace-temple complex covering an area of 280*150m was discovered that is usually divided into three groups of buildings. The northern area seems to have been a royal residence. The middle area includes an impressive building with a size of 85*15m (Wu 1994: 162). It seems to have been a kind of temple – perhaps the royal ancestral temple, or perhaps the royal audience hall, guessed from the fact that the site revealed several sacrificial pits containing animal and human sacrifices. The southern buildings likewise served for sacrificial ceremonies. The sacrificial pits clearly hold apart the remains of sacrificial animals from those of humans. Stone and bronze pillar bases are also found in Anyang. The roofs seem to have been made entirely of perishable materials like reed or grass, as no tiles were found. Walls were perhaps made of loam. Remainders of wall painting survive, and some decorative objects of stone, which show that the royal court tried to embellish these modest buildings somewhat. Xu (2013) explains that protective walls for cities were not common in ancient China. The presence or absence of a fortification system depended on the actual demand, but once it was regarded as a common feature (in or after the Han period 漢, 206 BCE-220 CE), it became an indispensable facility. The royal seat of Erlitou (Xia 夏 or very early Shang), Huanbei 洹北 (middle Shang), and Anyang (late Shang) were protected by a palace wall (gongcheng 宮城) with rampart zones (guoqu 郭區), while Erligang and Yanshi (early Shang) were protected by an inner wall (neicheng 内城) and an outer rampart (waiguo 外郭). In Houjiazhuang and Wuguancun in Anyang, thirteen large tombs were discovered. All of them have a 10-m deep tomb chamber, down to which four ramps are leading, the southern one being the longest, resulting in a cross-shaped structure of up to 100m of length. The tomb chamber containing the coffin, grave goods and servants accompanying the king, was made of wood. Traces of wood and painting remain in the mellow loess soil. The tomb chamber was sealed by many layers of stamped earth. In several cases, a kind of votive temple was discovered which stood on the ground level just above the centre of the tomb and included several rooms. 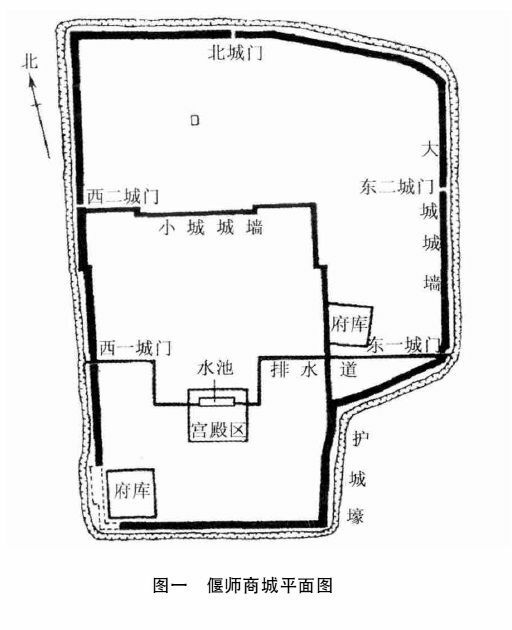 A late-Shang period tomb found in Tengxian 藤縣, Shandong, had a similar structure, and the ruins of the votive temple brought to light colouring of the wooden structures (Wu 1994: 165). Even if some musical instruments appear in earlier ages, the amount of instruments discovered increased, not least because of the inventions of bronze, a material to produce with various kinds of bells (nao 鐃, zheng 鉦, bo 鎛, ling 鈴) or drums (gu 鼓). In addition, certain types of stones with a compact mineralic structure were used to make sound stones (qing 磬). Clay was used for a kind of ocarina (xun 塤), but there are also finds of ocarinas made of bone or stone. 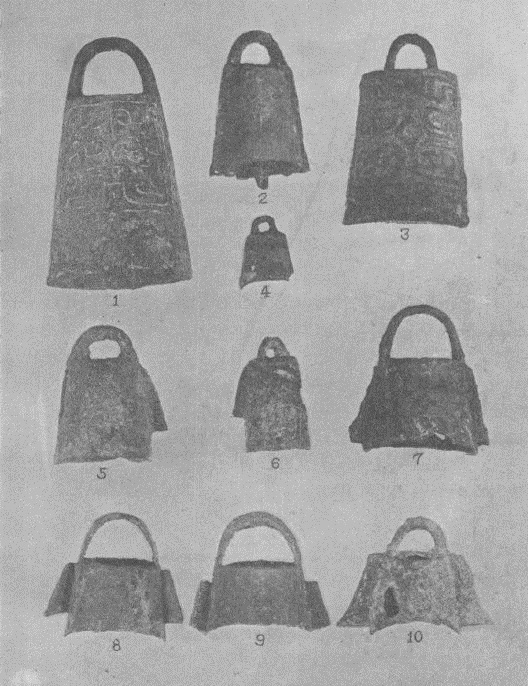 Nao and zheng bells were equipped with a handle. The opening of the sounding body itself was directed upwards, and the body struck with a kind of stick. Bells were used in series, so that a little "orchestra" was available accompanying certain sacrificial ceremonies or (ritual) dances. The tonal frame of set of three bells, for instance, ranged between 962Hz and 1,179Hz (Wu 1994: 156). 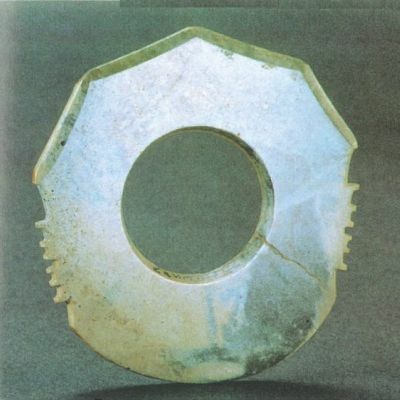 Zheng-type bells had the same shape as nao, but were larger, like the one excavated in Yueshanpu 月山舖, Ningxian 寧縣, Hunan, which had a height of no less than 103.5cm and a weight of 221kg (Wu 1994: 157). Ling are small bells, often translated as chimes. As in all Chinese bells, the opening is not round, but oblong, with two outward-pointed tips at the end. Some of the chimes had tongues, others not. Left: Nao 鐃-type bell from Xingan, Jiangxi, height 41.5cm, width of resonator 22.5cm. Right: Bo 鎛-type bell from Xingan, Jiangxi, height 31.6cm, width of resonator 26.6cm. Both from Jiangxi Sheng Wenwu Kaogu Yanjiuyuan (1997), plates 21, 21. Various types of ling-type chimes. Height: c. 10cm or more. Some authors count these chimes not among musical instruments, but among tools for daily use, for instance, as sound producers for chariots. Ma, Zhou, Zhang (1955). 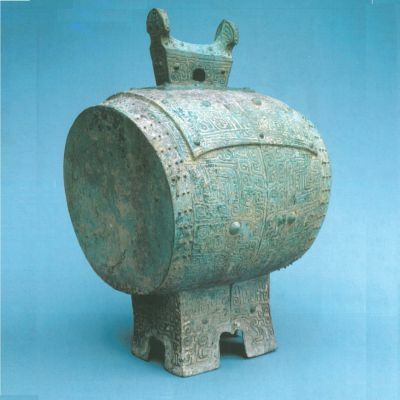 The most famous Shang-period drum was unearthed in Chongyang 崇陽, Hubei, in 1977. It has a diameter of 39 cm and a height of 75cm, and is decorated with fish-scale patterns. The five sound stones of the tomb of Queen Fu Hao are long rectangles, on one side with a pending hole, while the other, somewhat wider end, hangs down. The largest sound stone is 84×42cm large and was found in a tomb in Wuguancun, part of the Anyang site. Its tone is 280Hz. A wooden drum, decorated with a frog pattern (tuogu 鼍鼓), was discovered in 1935 in a tomb of Houjiazhuang, Anyang. 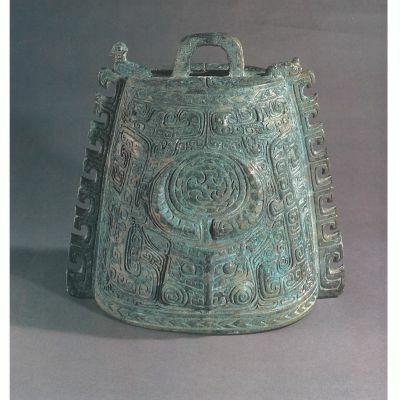 Late Shang-period bronze drum from Baini 白霓 close to Chongyang 崇陽, Hubei, discovered in 1975. Total height 75cm, diameter of beating surface 39.5cm. 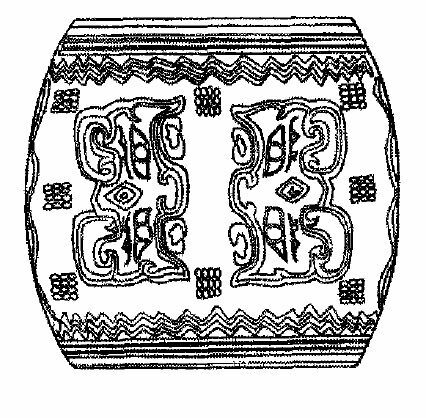 The barrel of the drum is decorated with a taotie pattern. From Du (2008). Reconstruction of a wooden drum from tomb M1217 in Houjiazhuang, Anyang, Henan. Height 68cm, diameter 60cm. The preservation status of the wood was very critical. Wang Yun (2003). Names of musical pieces for sacrificial or other ceremonies are mentioned in Lüshi chunqiu 呂氏春秋 (ch. Zhongxia ji 仲夏紀): The Shang performed the music of Dahuo 大濩 and Chenlu 晨露. The hymns of Shang which make out the last chapter of the Classic Shijing 詩經, belonged to the musical repertoire of the descendants of the Shang in the regional state of Song 宋. The chapter Jiaotesheng 郊特牲 in the ritual Classic Liji 禮記 explains that three pieces (que 闋) of music were performed before the sacrifices were carried out. Sacral music (wuyue 巫樂) was believed to be performed by a medium or shaman (wu 巫) during sacrificial ceremonies, while profane music (yinyue 淫樂) was performed at the royal court (Wu 1994: 159). The Zhou dynasty 周 (11th cent.-221 BCE) later denounced the secular court music of the Shang as immodest and obscene. The oracle-bone character for "dance" (舞) is the image of a person stretching out his arms, holding what appears to be tails of oxen (niuwei 牛尾). Texts mentioned several types of dance, for instance, the oxtail rain dance (daiwu 隶舞 or 代舞), the feather-crown rain dance (huangwu 皇舞), the king's wing dance (yuwu 羽舞), and others. Rain dances might also be performed by female mediums. For the exposure dance (baowu 暴舞), the dances exposed himself to fiery sunrays, and during the combustion dance (fenwu 焚舞), the dancer was burnt alive. Dancers sometimes accompanied a king into the netherworld, as can be seen in a royal tomb in Wuguancun, Anyang, where a dozen of females was buried along with musical instruments. An Jinhuai 安金槐 (1960). "Tantan Zhengzhou Shangdai ciqi de ji ge wenti 談談鄭州商代瓷器的幾個問題", Wenwu 文物, 1960/1: 68-70. Chen Gongrou 陳公柔, Zhang Changshou 張長壽 (1990). "Yin-Zhou qingtong rongqi shang shoumianwen de duandai yanjiu 殷周青銅容器上獸面紋的斷代研究", Kaogu xuebao 考古學報: 1990/2: 137-168. Chong Wen 崇文 (1978). "Hubei Chongyang chutu yi jian tonggu 湖北崇陽出土一件銅鼓", Wenwu 文物, 1978/4: 94. Guo Moruo 郭沫若, Hu Houxuan 胡厚宣 (1978-1982). Jiaguwen heji 甲骨文合集 (Beijing: Zhonghua shuju). Han Xin 韓欣, ed. (2005). Zhongguo qingtongqi shoucang yu jianshang quanshu 中國青銅器收藏與鑒賞全書 (Tianjin: Tianjin guji chubanshe). Jiangxi Sheng Wenwu Kaogu Yanjiuyuan 江西省文物考古研究院, et al., ed. (1997). Xingan Shangdai damu 新干商代大墓 (Beijing: Wenwu chubanshe). Karlgren, Bernhard (1937). 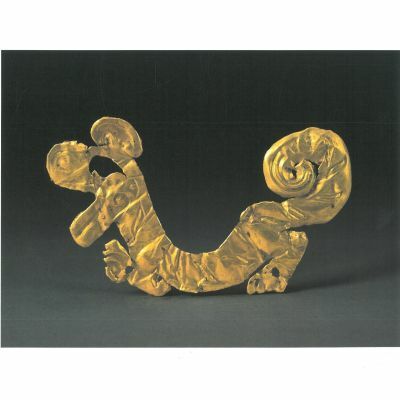 "New Studies on Chinese Bronzes", Bulletin of the Museum of Far Eastern Antiquities, 9: 1-117. Loehr, Max (1953). "The Bronze Styles of the Anyang Period (1300-1028 B.C. )", Archives of the Chinese Art Society of America, 7: 42-53. Ma Dezhi 馬得志, Zhou Yongzhen 周永珍, Zhang Yunpeng 張雲鵬 (1955). "1953 nian Anyang Dasikongcun fajue baogao 一九五三年安陽大司空村發掘報告", Kaogu xuebao 考古學報, 1955/1: 25-90. Ma Guowei 馬國偉 (2016). "Goudiao yu niao, duo, zheng 句鑃與鐃、鐸、鉦", Tianjin yinyue xueyuan xuebao 天津音樂學院學報, 2015/3: 59-67. Sanxingdui bowuguan 三星堆博物館, ed. (2005). Sanxingdui: Gu Shu wangguo de shenmi mianju 三星堆：古蜀王國的神秘面具 (Beijing: Wuzhou chuanbo chubanshe). Tan Derui 譚德睿 (2007). "Shang wanqi de qingtong yuanding - Zhongguo gudai yishu zhuzao xilie tushuo zhi qi 商晚期的青銅圓鼎——《中國古代藝術鑄造系列圖説》之七", Tezhong zhuzao ji youse hejin 特種鑄造及有色合金, 2007/7: 573-574. Thorp, Robert L. (2006). China in the Early Bronze Age: Shang Civilization (Philadelphia: University of Pennsylvania Press). Wang Yun 王芸 (2003). "Mugu he tonggu 木鼓和銅鼓", Yueqi 樂器, 2003/5: 92-93. Xia Nai 夏鼎 (1983). "Shangdai yuqi de fenlei, dingming he yongtu 商代玉器的分類、定名和用途", Kaogu 考古, 1983/5: 455-467. Xiong Xiaohui 熊曉輝 (2012). "Xiangxi gudai yueqi tong chunyu, tongzheng yu tong bianzhong 湘西古代樂器銅錞于、銅鉦与銅編鐘", Yanyi keji 演藝科技, 2012/10: 49-52. Xu Hong 許宏 (2013). "Dadu wu cheng: Lun Zhongguo gudai ducheng de zaoqi xingtai 大都無城——論中國古代都城的早期形態", Wenwu 文物, 2013/10: 61-71. Zhai Shengli 翟勝利 (2011). "Shangdai huiwu zangsu shitan 商代毁物葬俗試探", Zhongguo guojia bowuguan guankan 中國國家博物館館刊, 2011/3. Zhang Xingzhao 張興照 (2015). "Shangdai yiju shupai shui zongkao 商代邑聚輸排水綜考", Huaxia kaogu 華夏考古, 2015/1: 53-62. Zhongguo meishu quanji bianji weiyuanhui 《中國美術全集》編輯委員會/Li Xueqin 李學勤 (1985). Zhongguo meishu quanji中國美術全集, Gongyi meishu bian 工藝美術編, Vol. 4, Qingtongqi 青銅器, Part 1 (Beijing : Wenwu chubanshe). Zhongguo meishu quanji bianji weiyuanhui 《中國美術全集》編輯委員會/Xia Nai 夏鼐, ed. (1988). Zhongguo meishu quanji 中國美術全集, Gongyi meishu bian 工藝美術編, Vol. 1, Taoci 陶瓷 (Shanghai: Shanghai renmin meishu chubanshe). Zhongguo meishu quanji bianji weiyuanhui 《中國美術全集》編輯委員會/Yang Boda 楊伯達, ed. (1986). Zhongguo meishu quanji 中國美術全集, Gongyi meishu bian 工藝美術編, Vol. 9, Yuqi 玉器 (Beijing: Wenwu chubanshe). Zhongguo meishu quanji bianji weiyuanhui 《中國美術全集》編輯委員會/Zhu Jiajin 朱家溍, Wang Shixiang 王世襄, ed. (1987). Zhongguo meishu quanji 中國美術全集, Gongyi meishu bian 工藝美術編, Vol. 11, Zhu mu ya jiao qi 竹木牙角器 (Beijing: Wenwu chubanshe). Zhongguo Shehui Kexue Yuan Kaogu Yanjiusuo Anyang Gongzuodui 中國社會科學院考古研究所安陽工作隊 (1977). "Anyang Yinxu wuhao mu da fajue 安陽殷墟五號墓的發掘", Kaogu xuebao 考古學報, 1977/2: 57-98. Zhongguo Shehui Kexue Yuan Kaogu Yanjiu Suo Henan Di Er Gongzuodui 中國社會科學院考古研究所河南第二工作隊 (2006). "Henan Zanshi Shangcheng IV qu 1999 nian fajue jianbao 河南堰師商城ＩＶ區１９９９年發掘簡報", Kaogu 考古, 2006/6: 32-42.